We are pleased to announce that the 21st International Conference on Secondary Ion Mass Spectrometry - SIMS21 will be held in a beautiful city of Kraków, Poland, from 10 till 15 September 2017. The conference will provide a global forum for researchers and users from academia, research organizations and industries to exchange results and new ideas on Secondary Ion Mass Spectrometry and related techniques. The conference will cover advancements of scientific knowledge from fundamental understanding to new applications. The motto of the conference is "New frontiers": it will focus on recent advances and breakthroughs in Fundamentals and Applications, participation by young researchers is particularly encouraged and this is the first time the International SIMS conference will be located in one of the former eastern block countries. The IUVSTA-sponsored Short Course will be held in conjunction with the conference on September 10, 2017. An All-day Special Session/Workshop entitled "Frontiers and Challenges in Industrial SIMS" will be held on the use of SIMS in applied materials research with emphasis on industrial applications. The low student conference fee and inexpensive housing at University dormitories are provided to strongly encourage students to participate in the meeting. 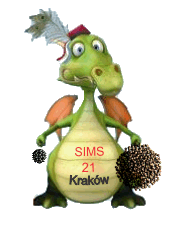 We cordially invite you to attend SIMS21 in Kraków. We hope that you will enjoy not only the scientific atmosphere during the conference, but also a beautiful city with its outstanding historical heritage and modern cultural activities. Photos taken during the conference can be found here. A movie from the Banquet is still to come.